The Heat will be stepping up the level of competition this year in men’s and women’s basketball and volleyball after officially becoming members of the CIS. The University of British Columbia’s Okanagan campus Heat are ready to meet some of the best intercollegiate teams in the land, and the action begins this fall. This marks the first year the men’s and women’s volleyball and basketball teams will compete in Canadian Interuniversity Sport (CIS) after the teams were accepted into the Canada West Universities Athletics Association in May. Sought-after Terry Fox Secondary School graduate Bret Macdonald says the university joining the CIS provides the level of competition he is after. Alex Basso is not only a fourth-year Human Kinetics student, but a women’s volleyball team veteran who looks forward to mixing it up in the CIS. “It’s better to be pushed. It’s the highest level of competition in Canada so it’s pretty awesome to be part of it,” says Basso. The Heat opens their volleyball season with a home game Oct. 28 against the University of Winnipeg, but the hottest rivalry in Western Canada boils over when the UBC Thunderbirds come to campus Nov. 4 and 5. The basketball season starts on the road Nov. 11 at the University of Lethbridge and the Heat finish regular season play on Feb. 12. 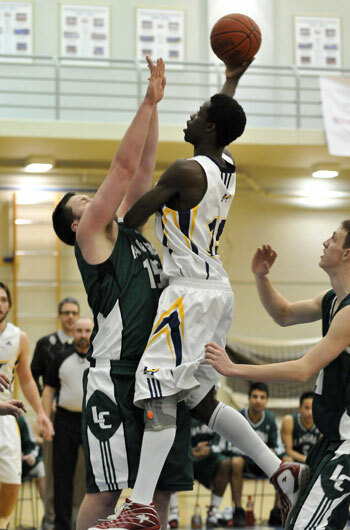 Their first home game is Nov. 25 when they host the University of Regina. On other sports fronts, the men’s soccer team hits the field with a new bench boss. The campus hosts the 2011 BCCAA men’s and women’s provincial soccer championships this fall. Competition is scheduled for Oct. 28 to 30 on the Nonis Turf Field. The soccer season runs from Sept. 10 to Oct. 23 with provincial and national championships following. The golf team, led by new coach Terry Nicol, hosts a tournament this year at Okanagan Golf club Sept. 24 and 25. The full golf season runs from Sept. 17 through Oct. 21, with the last four days in P.E.I. at the national championship.